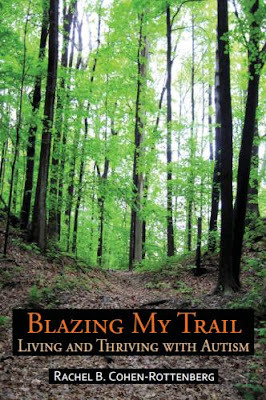 "Blazing My Trail: Living and Thriving with Autism" by Rachel B. Cohen-Rottenberg is a "sequel" to "The Uncharted Path" which I reviewed here and followed up here. When we last left Rachel's story, she had fully accepted her place on the autism spectrum and was making plans to take control of parts of her life. The plans weren't big plans but every long journey begins with small steps. At times, it feels like an entirely different person has written this book. This Rachel is capable, confident, assertive (without being nearly so argumentive) and full of promise. Yes, it is a sequel and indeed in the first chapter or two, it feels like you need to have read the first book - but then it all changes and from then on, whenever it references past events, it provides a handy recap. I feel that the titles of the books were very well chosen, with "The Uncharted Path" being about taking uncertain steps into unknown territory and Blazing My Trail being about running with full confidence along that path and leaving a trail for others to follow. I get the feeling that Rachel's experience with medications had a lot to do with this positive turn of events and she spends a bit of time talking about their effect. Unlike many people, I'm not a "hater" of medications. I've seen them doing good under the right conditions. Rachel's medications however are a good reminder that regardless of how many second opinions you get, not all drugs are suitable and all must be strictly monitored with specific measurable goals in place. Some types of drugs shouldn't be taken except in the most crucial of situations. The book provides a lot of practical and ready-to-use advice and insight for adults on the spectrum (and parents of children on the spectrum). In particular, Rachel talks about ways to overcome the sound and spatial sensitivities which are obviously the issues which give her the most trouble. Rachel also covers everyday events such as standing up for your rights as an individual - something that I, and many shy(?) aspies have a great deal of trouble with. The second half of the book is more of a discussion of "bug bears". Rachel's feelings about the social constructs around the autism community and their perception by the wider community in general. A lot has changed. The "old" Rachel would have written this aggressively like a lone revolutionary out on a crusade but this "new" Rachel is quietly persuasive, tolerant and altogether more worldly. She is not afraid to change her opinions or to challenge the deep seated beliefs of the wider autism community. The result is some pretty engrossing reading. I also noticed that Rachel uses the word Aspergers more often than Autism in this book. This was strange because it felt like the word "Aspergers" had been purged from her last volume in favor of Autism. I'm sure there's an interesting story behind the turnaround but sadly it's not covered in the book, though there seem to be some tantalizing hints. Rachel raises some absolutely brilliant concepts and covers various subjects including abelism. the puzzle piece metaphor, the theory of mind, the perception of "autism as a sickness" and label-grief. I enjoyed this book even more than the Uncharted Path, mainly I think because of the positive outlook. This is a brilliant book by one of the most individual writers in the autism community which will have you pondering the issues it raises long after you've put it down. Blazing My Trail is available on Amazon. Honesty Clause: I was provided with a copy of this book at no charge for review purposes. It looks like another great book, I love what the author writes, I plan on buying it soon. In times like this I hate that the freight of books for my country is so expensive and take almost two months. I just wanted to take the time and thank you for all the great info that you provide in this blog! I have autism and Sensory Processing Disorder and love to read others and how they conquer their daily battles! Have a great week ahead and keep up the great work! I'm always excited to learn about new books about autism. I'll definitely take a look at Rachel's book. Another book I found recently that concerns autism is 'Austin Nights' by Michael Davidson (herocious). While it's not a mystery, its use of numbers reminds me a lot of 'The Curious Incident of the Dog in the Night-Time", which I just loved.